Who doesn't love fresh, hot corn cob on a rainy day? 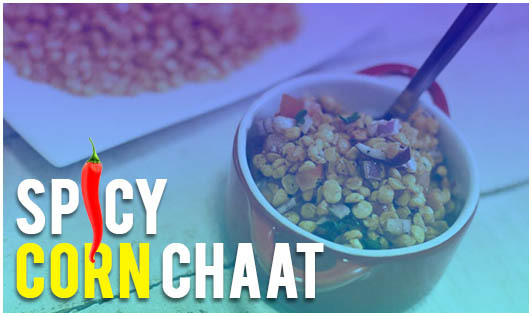 Spicy corn chaat is a perfect low-calorie recipe for the monsoons. It's extremely easy to make and does not require any cooking skills. • Steam sweet corn for 5 to 7 minutes or microwave on high power for 4 to 5 minutes. • Cool the corn at room temperature before using. • Take a medium-sized salad bowl and add sweet corn, chopped onion, cucumber, and tomato, and mix them all together with the help of a spoon. • Now add all the spices, green chilies, chaat masala, and salt and mix well. • Next, squeeze some fresh lemon juice, add coriander, and give a quick stir. • Garnish with bhujiya and serve immediately.